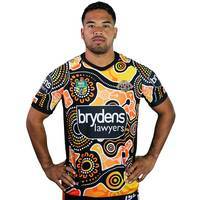 The Wests Tigers 2018 Indigenous jersey which is designed by Sydney artist Vicki Golding and is a representation of the club players, members and supporters as well as acknowledging Aboriginal history and culture. 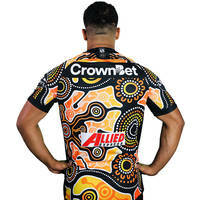 Vicki is the mother of Dennis Golding who designed our first two Wests Tigers Indigenous jerseys. The main elements in the artwork depict a number of circular images which is a symbol most commonly known in Aboriginal art as a meeting place or camping ground. Vicki Golding has also used other elements such as dots and pathway lines to highlight a connection that brings Indigenous and non-Indigenous peoples together to share stories and unite as one. The jersey will be worn in round 10 at Leichhardt Oval v North Queensland Cowboys.